We are a high resolution printer so we require all files submitted to be 300 dpi (or pixels per inch or dots per inch) and template downloads to be in CMYK color mode. Please note that if you 72dpi or lower your file cannot be used. Now, let’s get to the designing part. 1. Open the Template: Open your template (it doesn’t matter which one you’re using, this will always work in the same process) in Photoshop. Double-check to make sure that it opens in the right color mode (click “Image”, hover over “Mode”) and that it is the right dpi (click “Image”, choose “Image Size”). If not, make any necessary adjustments. There are templates available at http://apexprints.info/PrintDesignTemplates.aspx . Most templates will include a set of guides that represent “trim” and “safe margin”. The trim line is where the business card will be cut. Then, everything inside the safe margin will show on your finished card. We recommend using full bleed – meaning that your colors cover the whole card, going outside the trim – and that your text and other important elements are all kept inside the safe margin. This helps ensure that your card will be fully colored, and that nothing important will accidentally be cut off. 2. Choose Graphics and Colors: If you have a specific graphic (a logo, for example) that you want to include on your business card, open it up in Photoshop. From this graphic, you’ll build a color palette that will be used in your card. To keep it professional looking; try to limit your color palette to 3-5 colors. Each color should be used for a specific reason, not just to “look nice”. You have a very small amount of space in which to make a large impact, so make every single element count. When you’re choosing graphics to include, make sure that they’re large enough to work on the card. They’ll either need to be a 300 dpi image, or an exceptionally large graphic. 3. Set up the Space: First, fill your background with either a light or a dark color. In-between shades make it difficult to read text, because it’s hard to find colors that are bright enough or dark enough to contrast well. Of course, you don’t have to fill the background at all – you can always stick with white. The biggest factor in deciding what color to use for your background is what color is already used in the background of your graphic(s). In my case, I’ll be sticking with white. Next, use a contrasting color from your graphic to create a text space on your card. This space can be to a side, fill up a third of the card, or any other variation you like (see Illustration 01) – the point is that using a text space makes it that much easier to define the parts of your card, which in turn helps you make a stronger impact with it. 4. Experiment with Fonts: In the text space, lay out your basic information. At the top, and in the largest size text, should be your business name. Directly below that should be your own name, and your title. Additional information would include the variety of ways to contact you, view your work, and purchase items. Once your information is typed out, experiment with the fonts you use. If you already use a specific font for your business name in things like your website or logo, you’ll want to use that same font here. Other than that, it’s free game. For the most part, you will want to stick with 2 fonts- a fancy one for the business name and a plain one for your personal information. 5. Save your Card: Make sure that you’re choosing a format that your printer supports. We support Photoshop’s native .psd format. To save as a .psd, just click “File”, and choose “Save As”. If you need to save it in a web-browser supported format, go for a .png so that the graphic will remain 300 dpi after you save. Do not use the “Save for Web” mode, because this will take your image down to 72 dpi. Great job – now get that baby printed! 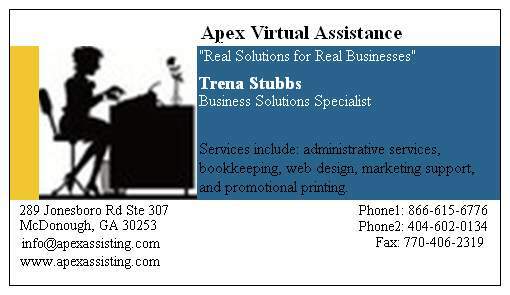 If you’d prefer a more professional design, contact Apex Bizness Solutions at 866-926-7362. Mention this blog and get a free proof (NO PURCHASE NECESSARY).